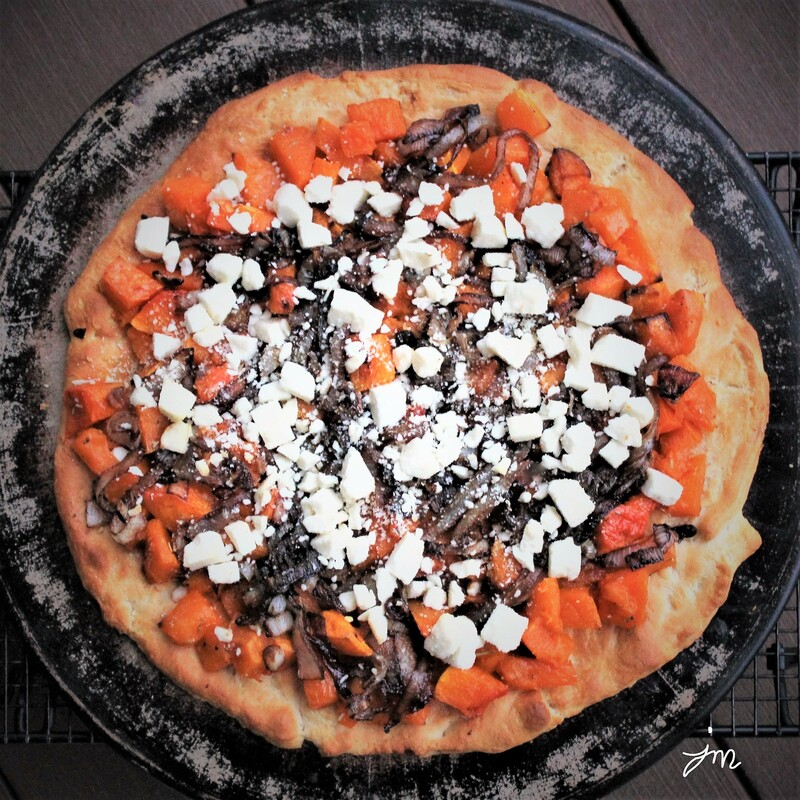 Butternut Squash, Caramelized Onion, and Feta Cheese Pizza. I am always looking for new ways to enjoy butternut squash, so I did a quick search and found a variety of pizzas using butternut squash. Yum! 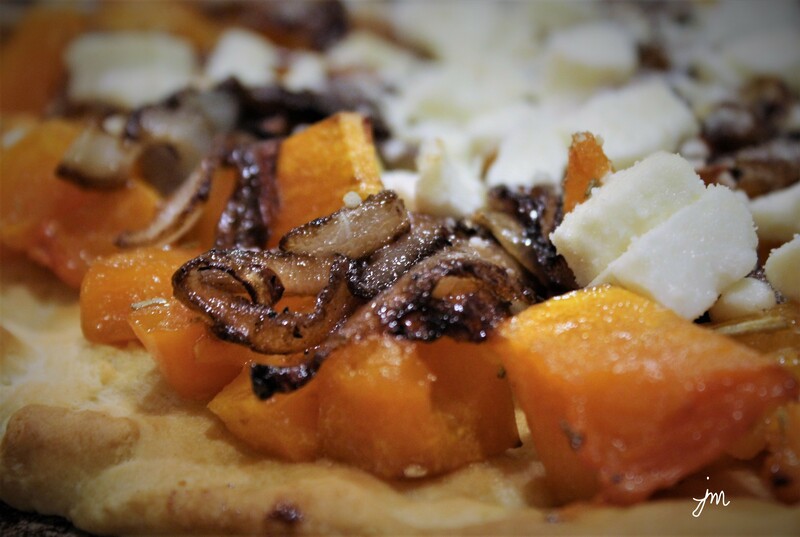 The one I found that had the flavors I love (and ingredients I had on hand), called for mashing the butternut squash as the “sauce” on the pizza, but I prefer the taste of cubed and roasted butternut squash, so I changed it up. Each roasted chunk gets a bit browned and even a bit crispy on the outside corners, but is soft and sweet and tender on the inside. I prefer that texture to mashed. Add feta cheese – and SCORE! We had this for dinner with a tossed green salad. If you are looking for a new twist on pizza or a meatless meal, this may just be the ticket! Here is how I made it. Hope you will give it a try. Preheat oven to 400 degrees F. Place cubed butternut squash on stoneware baking pan or baking sheet. Drizzle with 1 Tbsp olive oil, 1 tsp brown sugar, salt and pepper. Roast approximately 20 minutes, turning once midway through roasting, until slightly browned and tender. While squash is roasting, saute onions in 1 Tbsp olive oil and 1 tsp. butter, salt and pepper over medium heat until onions begin to caramelize, approximately 10-15 minutes. Add balsamic vinegar and brown sugar, and continue to cook for another 5 minutes. Bake pizza crust five minutes short of done on a round baking stone. 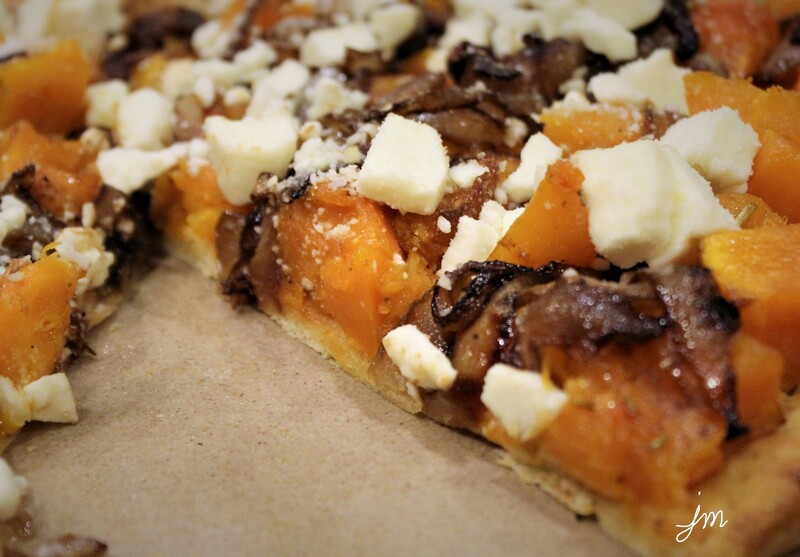 Remove from oven, and layer butternut squash cubes, caramelized onions, and feta cheese on crust. Return to oven for 5-10 minutes. Serve immediately. That sounds fantastic!!! I can’t wait to try it! I have a few packages of naan in the freezer, which works well as substitute pizza shell. There is nothing in your recipe that doesn’t sound delicious; can’t wait to try it! Thanks! wooohoo! Yes – Naan does make a great pizza shell. Will the Crankee Yankee try this? I think you would LOVE it! It would make a great appetizer too I think – cut into small pieces. Delicious, Jodi! As always! I’m a huge fan of butternut squash but I can’t imagine a better way to eat it. Save me a slice! Oh how I wish we could munch on it together – there in Ireland!!! Hope you will try making it. This has my name on it …. brave he that tries to stop me!!! Now this is something I can make…a good Friday night meal. Yum. Wow! What a great recipe! I believe you are the best cook in the U.S.! You have such amazing recipes! This is right up my pizza lovin alley, Jodi! I love that you didn’t mash the squash and used roasted cubes instead. Yes, caramelized onions make everything better! oh no you didn’t! Im making this dish! Oh Yes I Did! LOL! Hope you enjoy! Please do let me know. Looks yummy! We’ve just started Meatless Mondays at our house. This if next Monday for sure! Thanks. Oh I hope you enjoy it as much as we did! Hmm- I’m a skeptic like your husband. If you’re going to the trouble of making home made pizza, however, gourmet is the way to go! this looks sooooo yummy and creative! I honestly and truly had decided that “If you can’t say something nice, don’t say anything at all”…take the high road and all those virtuous sort of things. Then, it occurred to me…you can say something nice, Ellen. Butternut squash, I love butternut squash!! Alas, it’s all down hill from here. Caramelized ONIONS, I ask you, caramelized ONIONS? Need I say more??? Then we get to the Feta cheese! A combination of sheep’s milk and goat’s milk best left to lambs and kids (of a goat variety)! A brief return to nice now, I am fond of pizza crust. Roasted butternut squash swimming in melted butter on a pizza crust, it works for me! Thank-you! Isn’t it fun to see how many ways you can create a pizza? Last night we had one with leftover pork, pear, sweet potato and feta that was very tasty. Printing this! This recipe just may be the one that gets me to break out the bread maker to make some pizza dough! Adding yeast, feta, and butternut squash to my shopping list! woooohooo! Let me know how you like it! Wow, this looks sooooo tasty! Those caramelized onions…. yumm! I would eat a rock with caramelized onions on it – LOL! This is such an inspiring and tasty combination for toppings on a pizza, have to try it out! This looks delicious! Gotta try it! Thanks Linda! It was such a nice change up. Wow! That’s amazing! Such great ingredients. oh it was so yummy!